Instructors represented by CUPE 3093 have been on strike since March 5. This past week there were a couple of notable legal developments which have escalated the conflict. CUPE membership in a “final offer vote“. I explained that process in this post yesterday. If a majority of votes in of CUPE 3093′s three bargaining units accept the employer’s offer, that unit’s strike will end. A rejected vote means the strike continues. CUPE 3093 has recommended that the membership reject the employer’s offer. Secondly, both parties filed unfair labour practice complaints against each other. Here are the pleadings filed by both parties. Here is CUPE 3093′s Schedule A (statement of alleged facts and the arguments) in support of the unfair labour practice. Here is York University’s Response to CUPE’s complaint and also its particulars in support of its own unfair labour practice complaint against CUPE. These pleadings are a great source of background information about the collective bargaining issues and history and the strike. They also demonstrate the complexity of the issues involved and the large gap between the perspectives of the parties which helps explain the ongoing industrial conflict that colours this relationship. CUPE 3093 filed an unfair labour practice on March 21 against York that alleged three separate violations of the Labour Relations Act. Two of the complaints relate to alleged public misrepresentations by York of CUPE’s positions in bargaining which CUPE alleges constitute bad faith bargaining (in violation of Section 17 of the Labour Relations Act) and Sections 70 and 73, which prevent employer interference with the administration of the union and the union’s representation of its membership. The third complaint is that the employer violated Section 70 of the LRA (interference in the administration of a union) when it or someone acting on behalf of York purchased the domain name “CUPE3093.com” and then created a redirect from that URL to York’s strike website. I discussed this curious event and how it could be the basis for an unfair labour practice if York was involved in a post about a week before the complaint was filed. It will be interesting to see who is responsible for creating the redirect through CUPE3093.com. The domain host GoDaddy is named in the complaint and we should expect to learn the identify of the secret purchaser of “CUPE3093.com” soon. York has denied any involvement. If York is not involved, then presumably it was someone sympathetic to York who went through the effort of buying the domain name and creating the redirect during the last strike and the current one. Your guess is as good as mine why someone would bother doing this. In an interesting twist, York has counter-filed its own bad faith bargaining complaint against CUPE 3093 in addition to responding that CUPE’s complaints are meritless. York argues that CUPE is engaged in bad faith bargaining by bargaining to impasse an attempt to bring back guaranteed funding for “incoming Masters’ students” and have those graduate students treated as York employees as was the practice in the past. York changed the model so that graduate funding was not tied to a job, with the result that many graduate students no longer have jobs at York. 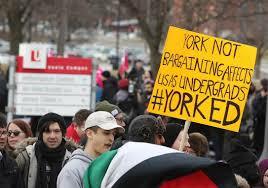 Because these students are no longer employees of York, York argues that CUPE’s attempt to bargain them back into the bargaining unit constitutes an attempt to unlawfully extend the scope of the unit by striking. The labour board has found in the past that it is a violation of the duty to bargain in good faith to “bargain to impasse” an extension of the bargaining unit. York argues that this is what is happening in relation to CUPE’s attempt to bargain protections for masters’ students who are not York employees. York also argues that CUPE has violated Section 76 of the Labour Relations Act which prohibits unions and union supporters from using intimidation or coercion to compel people to refrain from exercising their legal rights. York alleges that union officials and people acting on behalf of the union have engaged in a “campaign of public intimidation and harassment” that violates the Act, including through Twitter posts which are attached as an exhibit to the Employer’s response. The main complaint seems to be comments made about “scabs”, which in this case would be instructors in CUPE’s bargaining units who are crossing the picket line to continue teaching their courses. Often complaints filed during a strike never in fact get litigated, because once the strike is resolved there is often no point in going further with the litigation. Hopefully the strike will be resolved soon, although the tone of these complaints demonstrates that the parties have some serious labour relations tensions to deal with. If these complaints do get litigated, they will make for some interesting law. I think it is fair to say that some of the issues and arguments being made are complex and it is not obvious to me what way they would be decided.